Jaguars coach Doug Marrone put his future in the hands of John DeFilippo on Wednesday, naming him the offensive coordinator. The Jaguars enter a win-or-else year mandated by owner Shad Khan as Marrone begins preparing for his third season on the job. Predicting how it will go comes down entirely to DeFilippo’s offense. The Jaguars defense will remain one of the most talented units in the NFL. If the Jaguars can go from dreadful on offense to just mediocre, a playoff berth is possible. Marrone made the right call in hiring DeFilippo. The 40-year-old DeFilippo was fired from the same post with the Minnesota Vikings after 13 games this season and has a reputation as a passing-game specialist. I’m giving DeFilippo a pass for last season for a variety of reasons. Vikings quarterback Kirk Cousins completed 70.1 percent of his passes, throwing for 30 touchdowns and 10 interceptions this season for a passer rating of 99.7. If you give the 2019 Jaguars those numbers from their starting quarterback, they’ll win 11 games. Vikings receiver Adam Thielen caught 103 passes with nine touchdowns with DeFilippo, but managed just 10 grabs with no scores in the three games after his ouster. The Vikings running game never got on track, as running back Dalvin Cook was hampered by injury and only logged 87 carries in the 13 games DeFilippo was there. The offensive line lost several key players to injury by mid-September. Vikings coach Mike Zimmer is the NFL equivalent of former Florida coach Will Muschamp. He’s a gifted defensive coach, but as the head man he stifles his offense too much. The offensive-minded Marrone will turn DeFilippo loose. DeFilippo’s best work came in Philadelphia where he served as quarterbacks coach for two seasons in 2016-17. The Eagles won the Super Bowl last season, with Carson Wentz and Nick Foles both enjoying success. Wentz was well on his way to the MVP award when he suffered a season-ending knee injury in the 13th game. Wentz threw for 33 touchdowns and seven interceptions as the Eagles began the season 11-2. Foles is expected to be available this off-season after another productive run replacing Wentz that ended in the divisional round. 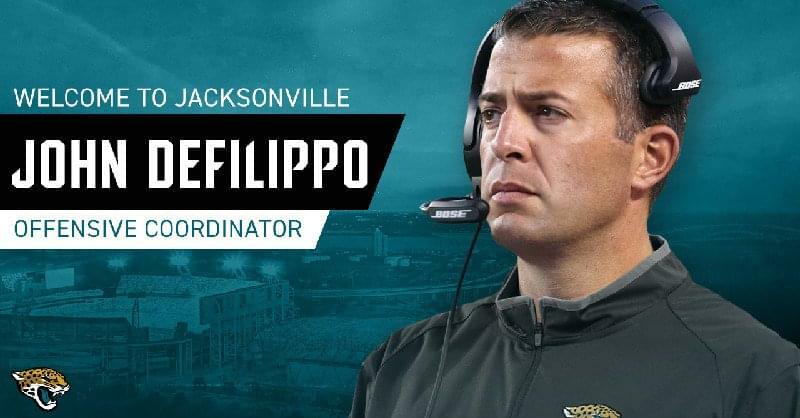 DeFilippo’s presence with the Jaguars strengthens the possibility of Jaguars personnel chief Tom Coughlin and general manager Dave Caldwell making an aggressive play for Foles to replace starter Blake Bortles. The Jaguars don’t have much to offer Foles in terms of a supporting cast, so having DeFilippo running the offense might be their ace in the hole. If the Jaguars can acquire Foles, his knowledge and relationship with DeFilippo would allow the offense to hit the ground running in the off-season program. If you have some time, find DeFilippo’s brilliant film breakdowns on YouTube from when he was in Philadelphia. They will fire you up. DeFilippo and Foles have a strong schematic connection as evidenced by the “faith throws” DeFilippo describes Foles throwing for touchdowns. If landing Foles doesn’t materialize, McCown could be in play for the Jaguars as a cheap option to compete with a first-round rookie. The 39-year-old McCown played for the New York Jets this season on a one-year, $10-million contract. He was awful in three starts, but has played decent football since turning 34 with 23 more touchdown passes than picks (61 to 38). Whether the Jaguars go for an expensive free agent, a cheaper veteran or rely on a rookie, Marrone has found a play caller in DeFilippo that has consistently gotten the most out of his quarterbacks. Hope is starting to return to TIAA Bank Field.